St. Patrick was born around the year 389 AD in what is now England. In his teens, Patrick was captured by Irish raiders and made a slave in Ireland, where he tended his master’s sheep for six years. After being told in a dream to prepare for a courageous effort that would take him home, he escaped, traveled 200 miles to the coast, and obtained free passage on a ship carrying dogs to France. He received some training for the priesthood in either Britain or France, and was ordained to the priesthood around the year 417. St. Patrick was made a bishop about 432 and was sent to Ireland about 435, to succeed St. Palladius, the first bishop there, who had died. St. Patrick established himself in Armagh and traveled throughout Ireland, preaching, teaching, performing miracles, and converting people of every rank. He established the Catholic Church in Ireland and built churches, schools, and monasteries. Because of his work in organizing the Church in Ireland and bringing it into a closer relationship with the Western Church, St. Patrick is called the “Apostle of Ireland.” St. Patrick died in Ireland about 461. According to legend, St. Patrick used a shamrock to explain the mystery of the Trinity to the people of Ireland. While, even today, the shamrock is a helpful teaching tool, it remains impossible for us to understand the mystery of three distinct persons in one God. Yet we are able to embrace this tenet of Christianity because we have been given the gift of faith. I believe in You, God, my Creator and the Creator of all things in the universe. I believe in You, Jesus, my Brother and my Friend. You are indeed, the Son of God, who came to live among us and to redeem us through Your suffering, death, and Resurrection. I believe in You, Holy Spirit, my constant companion. You live within my heart as a source of guidance, strength, and comfort. You are three persons in one God. I adore You and give myself to You. Send your prayer petition to be included in St. Patrick Novena. As a youth, St. Patrick was a slave in Ireland, separated from his family and everyone he knew. He must have felt lonely at times and certainly yearned to see them again. We all sometimes feel lonely. Even if we are living among family or friends, we can feel very alone or that no one understands what we are experiencing. Yet even at these times, God is with us. Jesus, how alone You must have felt when, after praying in the Garden of Gethsemane, with the weight of the world on Your shoulders, You found the Apostles sleeping. There are times when I feel there is no one to whom I can turn with my fears, my loneliness, my pain. At those times, Jesus, help me to see and take Your hand. And guide me, Jesus, to the people in my life whom You have sent as messengers of Your love. While a young slave in Ireland, St. Patrick learned to pray deeply as he tended his master’s sheep. Prior to this, he had not been a religious person, even though his grandfather was a priest and his father a deacon. The lesson for us is that, although we can communicate with God at any time and anywhere, we all need to set aside quiet time for prayer in solitude. This is essential to deepening our relationship with God. Oh God, how I yearn to sit quietly with You, like a child at Your feet, listening and learning in the deepest recesses of my heart. As You did with St. Patrick, draw me into solitude with You. Reveal Yourself to me and teach me Your ways. In this manner, You will strengthen me to serve You in this world. As a young man, St. Patrick studied for the priesthood, but his education was not of a high standard. Yet St. Patrick did great things for God as His missionary to the people of Ireland. God also calls us, regardless of our faults and failings, to be missionaries and messengers of the Good News of salvation. Jesus, I am far from a perfect person. You know my faults, flaws, and weaknesses. But You also recognize my strengths and abilities far better than I do. You have chosen me to be Your messenger to the people I encounter in my life each day. I accept Your call and give myself to You. Let Your love and compassion flow through me to others. Heal my faults, strengthen my weaknesses, give me courage so that I can be Your faithful messenger today and every day. St. Patrick’s work for God in Ireland was not easy. He called people to set aside their pagan beliefs and embrace Christianity. It is difficult for people to accept any kind of change, and it is especially difficult for people to change their basic beliefs. St. Patrick often feared that he would be killed violently or thrown back into slavery. Yet he persevered because he trusted in God completely. God, increase my trust in You. I am weak. I give my problems and worries to You. But then I take them back. An unlike St. Patrick, I sometimes let my fears keep me from doing Your work of reaching out to others with love and compassion. I want to be like St. Patrick and trust in You completely. Help me, God. According to legend, St. Patrick drove the snakes out of Ireland . While there is no proof that this actually happened, St. Patrick did drive the evils of paganism, idolatry, and sun worship out of Ireland. In ridding the country of these “snakes,” he opened the hearts of the Irish people to receive God. We all have “snakes” inside us that keep us from being all that God wants us to be. Our “snakes” might be crippling fears, low self-esteem, or an addiction. Or they might be evils such as prejudice, materialism, or self-centeredness. God has the power to drive these “snakes” from us. But we need to ask. Oh, God, I have many faults that get in the way of my bringing Your love and compassion to others. I want to do Your will but there are many times when I fail through sin. Please forgive my sins, Lord. I am truly sorry for them and want to overcome my weaknesses. You know, better than I, the evils that lurk within me and cripple me. As You sent St. Patrick to Ireland, send people into my life to drive these “snakes” from my heart, so that it may be a pure dwelling place for You and a source of strength and courage for me. Despite his experience in Ireland as a slave, St. Patrick loved the Irish people. As a bishop, he was willing to return to them and to risk his life to bring the Irish the Good News of Jesus Christ. How painful it would be for St. Patrick to walk the roads of Ireland today and witness the divisiveness and injustices that continue to feed a festering anger and mistrust in Northern Ireland. Today, God, I pray that peace will come to Ireland. I pray for an end to prejudice, discrimination, and other injustices that pull the people of Northern Ireland apart. I pray also that all the people of Ireland will be blessed with open hearts and love for one another. I ask, Lord, that all the people of Ireland will soon know the joy of true peace in their land. Ireland is a beautiful country. 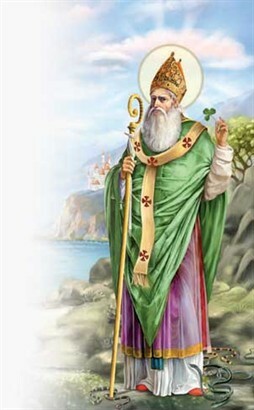 St. Patrick worked mostly in the western regions, where the Atlantic Ocean pounds the rocky coast. Inland, low mountain ranges give way to the central plain, with its many bogs and lakes. Marsh plants and ferns abound, and the countryside is blanketed in green grasses that give Ireland great beauty. It is obvious that nature in Ireland helped St. Patrick connect with God when, as a young slave, he tended his master’s sheep. We too, can draw closer to God through nature, whether we are walking, sailing, gardening, watching birds, tending houseplants, viewing a nature film, or simply relaxing in nature. God, You have given us a world of great natural wonder and beauty. Too often, God, we have polluted and destroyed our fragile environment. I pray, today, that we will learn to nurture and protect our environment for the enjoyment and use of future generations. I ask You, also, to guide me to make choices that will benefit nature, not harm it. Today is the day the Irish people give thanks to God for bringing St. Patrick to live among them and open their hearts to God. Of course, St. Patrick was simply God’s instrument. It is through Jesus’ life, death, and Resurrection that we have been saved and have come to know God. Thank You, Jesus, for everything You have done for me. You came to live on earth and showed me how to live a life of joy and love and service. You suffered and died and rose from the dead so that I would have eternal life. You walk with me each day, giving me encouragement, guidance, and unconditional love. You forgive my sins, heal my wounds, and feed my soul. I can never stop thanking You, Jesus, my Lord and my God. I love You, and I am Yours.